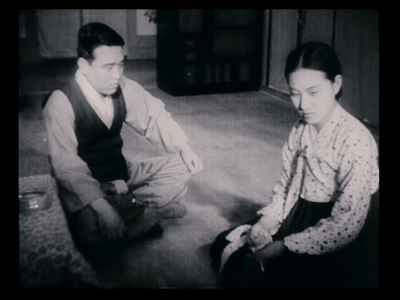 Yang Joo-nam’s 1936 film Sweet Dream is one of the earliest surviving Korean films. It was found in the China Film Archive in 2005 (along with several other films), and the Korean Film Archive restored these films, which were in various states of disrepair. The final results premiered at the Pusan International Film Festival in 2006. Sweet Dream had its first U.S. screening in 2009 at the Museum of Modern Art as part of its series “Korean Films Made During the Japanese Occupation,” which represented a rare opportunity to view these valuable examples of a crucial period which has heretofore been a lacuna in Korean film history, most pre-WWII Korean films lost from destruction in wartime, or through neglect. The brief 48 minutes of Sweet Dream reveal a skilled filmmaker with the ability to tell a story concisely, with evocative and moving symbolism. The film begins with a bird in a cage, which is connected to the character of Ae-soon (Moon Ye-bong), the restless wife at the heart of this story. She is a haughty, materialistic “modern woman” with expensive tastes. In the first scene, her long-suffering husband Seon-yong (Lee Keum-ryong) berates her for being neglectful of their daughter Jeong-hee (Yoo Seon-ok), as she goes out clothes shopping. She protests to her husband, “I am not a bird in a cage!” after which the camera cuts to a bird in a cage. Jeong-hee loves her mother unconditionally, regardless of how cruelly or neglectfully she is treated. She is a good, pure-hearted girl, the opposite of her mother. Ae-soon’s wandering spirit takes her through the many different social spaces and levels of society, representing her ambition to elevate her status by latching onto a rich man. She believes she has found one in Chang-geon (Kim In-gye), whose shady character is immediately revealed when he steals her purse at the department store, and later “finds” it, using this to insinuate himself into her life. Her angry husband throws her out of the house when she finally returns. Jeong-hee cries for her mother as she leaves the house, and after her mother is gone, she cries out for her in her sleep. This may be one of the meanings of the film’s title: the daughter’s longing for reconciliation with her lost mother. The “sweet dream” could also be that of Ae-soon, who is constantly looking for a better circumstance for herself, and bases all her relationships on hooking up with those who can get her there. She often has a sneer on her face, contemptuous of all around her, refusing to be the model wife. The mother and daughter in the film are connected by dreams: Jeong-hee has feverish dreams crying for her mother, and Ae-soon wakes up in her new lover’s hotel room, telling Chang-geon that she has “strange dreams.” Ae-soon has no loyalty to anyone – after Chang-geon abandons her during a dance performance, she goes backstage to flirt with the lead dancer, bringing him flowers (which the dancer dismissively rejects after Ae-soon leaves, giving them to one of his female assistants – “Pretty flowers have thorns,” he says, sizing up Ae-soon immediately). After she finds out Chang-geon lied to her about being rich (he is a petty thief who lives at a laundry instead of the extravagant hotel room he has rented as part of his ruse), Ae-soon turns him in to the police without batting an eye. She then speeds away in a cab to the nearest train station, exhorting the driver to go faster, an act which leads to the film’s tragic ending. What makes the discovery of Sweet Dream such a valuable thing is that with its many street scenes, and scenes set in cafés, hotels, department stores, and theaters, we can see what Seoul looked like in the 1930’s. Through Ae-soon’s journey, we are privy to the many different social spaces of the time. In this occupation period, there seems to have been, at least to my untrained eye, a mix of traditional Korean and Japanese architecture. Also, modern traffic was a new phenomenon in Korea at that time, and one scene in the film features a teacher giving a traffic lesson to his students, instructing them on how to navigate the now potentially dangerous roads. This seemingly incongruous scene sets up a tragic occurrence later in the film. Moon Ye-bong, who plays Ae-soon, was a major star of the time – she also appears in three other films that also screened in the MOMA series: Military Train (1938), Angels on the Street (1941) and Straits of Chosun (1943). In Sweet Dream, Moon played a very different character than in her previous film, a 1935 adaptation of Chunhyang, the classic pansori tale of a virtuous wife which was Korea’s first talkie. The faithless character of Ae-soon makes Sweet Dream a precursor to another classic Korean film, Han Hyung-mo’s Madame Freedom (1956), which also dealt with a woman straying outside of her marriage. However, this later film is a little easier on its female protagonist, sparing her the cruel finality of fate visited on Ae-soon in Sweet Dream. The Korean Film Archive did a terrific job restoring this film, as can be seen on the DVD of Sweet Dream, which is part of the box set “The Past Unearthed: The Second Encounter Collection of Chosun Films in the 1930’s,” which also includes two other films from the 1930’s that screened at MOMA: Military Train (1938) and Fisherman’s Fire (1939). As with every aspect of Korean society during this period, the film industry was controlled by the Japanese colonial government. And although the descriptions of these films may give the impression that these were simple propaganda films, this is not always the case. Certainly that could be said of Military Train, which centers on a train that is enlisted to carry soldiers and munitions to Manchuria (the Second Sino-Japanese war was well underway), but even that film contains elements that complicate its ostensible status as uncomplicated propaganda. Sweet Dream contains no discernible pro-Japanese ideology, but instead is an elegantly filmed melodrama. Yang Joo-nam, who made his debut with Sweet Dream, didn’t make a second film until twenty years later, and made only five films in total, although he worked as an editor on other films throughout his career. Not only a potent melodrama, but a valuable visual documentary record of Seoul in the 1930’s, Sweet Dream is a richly textured gem well worth seeking out.